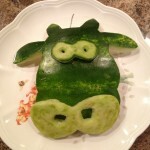 A food + electronics project? Yup. 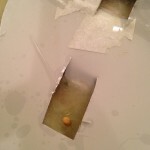 Please be careful if you plan to do this. 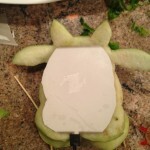 Electricity and water(melon) don’t mix well. I got shocked a few times. 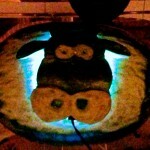 I made this glowing cow watermelon for my annual Beef Appreciation BBQ. 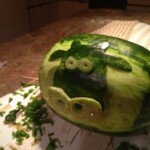 After I gutted the watermelon, I cut out a cow face with a few layers to give it some dimension. 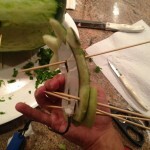 I kept it all together and attached it to the watermelon with Kebab sticks and toothpicks. 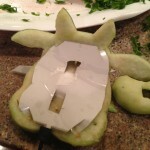 On the back of the cow face, I cut out a piece of EL Panel that I got from Adafruit. This is cool stuff. 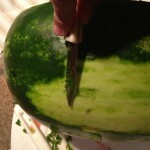 I attached it by cutting little tabs that I then stuck into the watermelon rind. 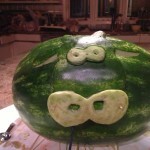 The watermelon not only glowed, but shocked you if you touched it. 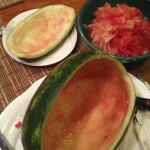 After being shocked a few times, I decided not to put the fruit salad into the watermelon for the comfort of my guests. However, it did dry before the event and stopped shocking people. Looks ok, but the glow would look better against a lighter background. Now just need to plug it in..